Belgium is still without a government but its cultural life continues as intensely as ever, with an exhibition program of old art which is particularly rich. Based in Brussels, you need at least two or three days to visit everything in Flanders and Wallonia. In the capital, we will simply remind our readers of the exhibition devoted to Rubens at the Musées Royaux des Beaux-Arts since Alexis Merle du Bourg has already given us a very thorough review (in French) on La Tribune de l’Art. Nor shall we dwell on Le Grand Atelier, organized in conjunction with Europalia, as Roland Recht has granted us an interview that we publish here and which offers an excellent idea of the wealth of material in this ambitious retrospective covering several centuries of European art. We would simply like to point out the excellence of the museography, the pertinence in his statements and the superior quality of the works on display, many of which have rarely, if at all, been shown before. Europalia is also presenting at the same time an exhibition on Portugal in the sixteenth and seventeenth centuries, Autour du globe, but we will not be able to discuss it for not having seen it. Leaving Brussels, the museum goer can travel to Ghent to see British Vision a large retrospective of British art from the eighteenth to the twentieth century. We had already pointed out the recent reopening of the Fine Art Museum in this city, which unfortunately does not have room for temporary exhibitions, and thus has to empty part of its galleries to accommodate them. But amateurs of old art will not be disappointed, as only the twentieth century and some of the nineteenth has been removed for a few months in order to display this show of English paintings (still, we regretted not seeing Géricault’s Kleptomaniac). Several loans were made possible enabling the visitor a complete panorama with paintings, prints, drawings and some sculptures. The three sections in the exhibition emphasize the main trends in English art. 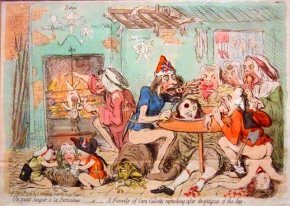 Society is devoted to portraits, to genre scenes and to caricatures which take up a whole, particularly amusing, gallery, with prints and drawings from James Gillray (with special note for his vision of the Terror – ill. 1), to Thomas Rowlandson and Georges Cruikshank. The second and very imposing section, retraces the history of English landscape painting highlighting mainly watercolors. Finally, The Visionary reveals a continuity in English art, from Blake to Bacon, through the oneiric representation of the unusual or strange. A special recommendation goes to the extensive catalogue, under the supervision of Robert Hooze, director of the museum. It is always a pleasure to visit Bruges if only to stroll through the town and take in again Memling’s works as well as Michelangelo’s Virgin with Child. However, the exhibition Joseph-Benoît Suveé et le néoclassicisme Bruges-Paris-Rome alone is not worth the detour. The high-sounding title is misleading and should have been qualified by adding : “in the collections of the museums in Bruges”. Anyone expecting an extensive retrospective of Suvée, situating him in the art of his time, will be deeply disappointed, because he will only see a grand total of five paintings, one of which, a copy after Jean-Jacques Bachelier who was his master, has not even been authenticated. Nevertheless, we would like to point out the exceptional quality of The Discovery of Drawing (ill. 2) shown in Paris in 1791, where the distortion in the neck of Dibutades, the young woman tracing the outline of her lover’s shadow on the wall, seems to be a forerunner of Ingres’ line . 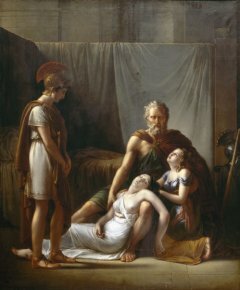 The exhibition is lacking in notable works, with the exception of the amazing Death of Belisarius’ Wife by Franciscus Josephus Kinsoen, which contains something of both David in his Belisarius and Guérin in the Return of Marcus Sextus, along with some fine portraits by Kinsoen and Joseph Ducq as well as some drawings by Suvée and Ducq. Consequently, the accompanying catalogue is a letdown, although it contains some worthwhile essays which would have been more interesting if the subjects had been better coordinated as they are very much alike (Suvée et his students in Bruges) and often redundant. Moving on to Wallonia, sculpture lovers should not miss the retrospective on Jean Del Cour. Located in the Eglise Saint-Barthélémy (recently, and strangely, restored) it plunges the visitor into Baroque Rome as the artist was very influenced by Bernini, although he probably never studied under him. 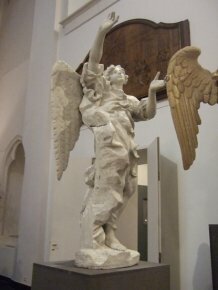 On loan from various churches and museums, the angels and saints in painted wood, often in a white color imitating marble (ill. 3), fill the nave and sides of the church in perfectly appropriate abundance. Numerous studies in terra-cotta (ill. 4) help in understanding the sculptor’s work. These statuettes are treated in a vibrant and vaporous manner, easily recognizable. For obvious reasons, the largest and most beautiful marble pieces could not be shown here. Thus, a visit to the Cathedral was in order to admire the magnificent Recumbent Christ (ill. 5), the only element remaining of the funerary monument to the bourgmaster from Liège Waltère de Liverlo and his wife, Marie d’Ogier. At the end of his career, Del Cour still refers to the Roman Baroque which had so marked his beginnings : this Christ does in fact recall the many recumbent statues found in the Eternal City, notably the Saint Sebastian by Giuseppe Giorgetti in the Basilica of San Sebastiano Fuori le Mura. Giorgetti’s work, produced after Del Cour returned to Liège, could not have influenced him directly but proves how Bernini and his students left their imprint on his art. There is also a Christ on the Cross in bronze. 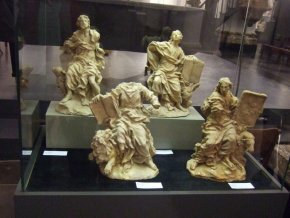 The Treasury in the Cathedral has been included in the tour and displays some other pieces by the sculptor. For those readers travelling to Gand, the Cathedral is a must just to see Del Cour’s other masterpiece in marble, dating this time from his early career, the splendid funerary monument of Eugène Albert d’Allamont. It is a mystery that an artist of his rank should remain virtually unknown outside of his own country. An excellent monographic study has just been published by Editions Racine on the occasion of this retrospective and, besides offering other works than just those presented here includes the complete catalogue raisonné for Del Cour. Finally, we would like to mention the exhibition at the Musée d’Ixelle, All Roads Lead to Rome. Artists and their Travels through Europe (XVIth-XIXth CC.) that we did not see (nor the catalogue) and the one in Namur, the first to feature Antoine Wiertz, evidence once again of the vitality of a country which we hope will soon overcome its present quandary. Collective work, Joseph-Benoît Suvée et le néoclassicisme Bruges-Paris-Rome, Editions Snoeck, 208 p., € 30. French Edition ISBN : 9789053496640. Dutch Edition ISBN : 9789053496633. Website of the Museum voor Schone Kunsten, Bruges | | Michel Lefftz, Jean Del Cour 1631-1707, Editions Racine, 2007, 192 p., € 45. ISBN : 9782873864620. We are indebted to Stéphane Guégan for pointing out this analogy to us. Previous article in Exhibitions : Interview with Professor Roland Recht, member of the Institut de France, commissioner of the exhibition Le grand atelier. Chemin de l’art en Europe Ve-XVIIIe siècle.